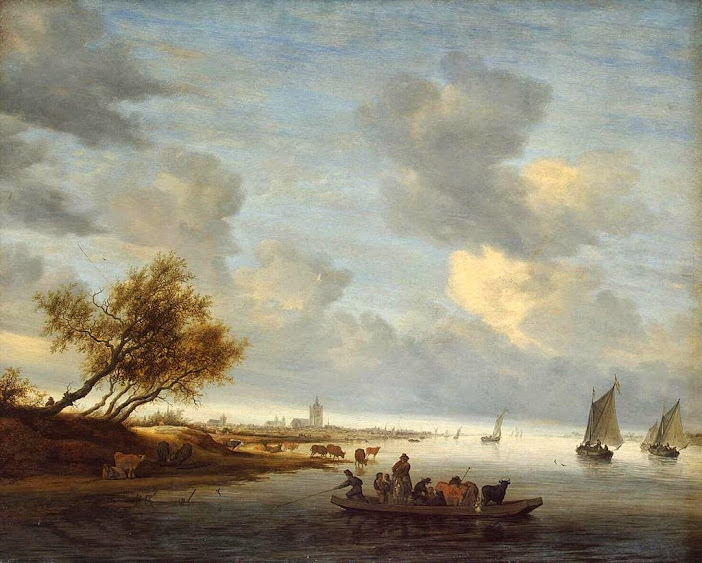 Painting by Salomon van Ruysdael (1629-1681). One of a distinguished family of painters, his prolific work is almost exclusively landscapes, most featuring the great billowing clouds that sweep across the dead flat Low Countries. A minority of the titles of the works identify the location specifically, and in the image any landmark is to be found in a distant steeple which acts as something of a pin market on the land. The exception to this painting of "general river scene" is the great works of the unmistakable Valkhof at Nijmegen.